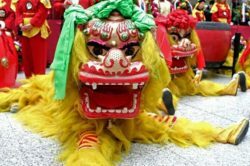 Join and celebrate the Year of the Boar at the annual Chinese New Year Festival, a day filled with excitement and fun at the Oakland Asian Cultural Center. Children’s Activities: Bring along the little ones for storytime and a book give-away. The first 75 to participate in story time will receive a new book. Children can select 1 from nearly 30 titles of children’s books about Lunar New Year or Asian culture, presented in partnership with Eastwind Books of Berkeley with support from the Oakland Literacy Coalition. Also kids can take part in bilingual storytime (English and Spanish), music, shadow puppet making and a show with Kids Go Mandarin music class.